First code, originally uploaded by Alan Perryman. 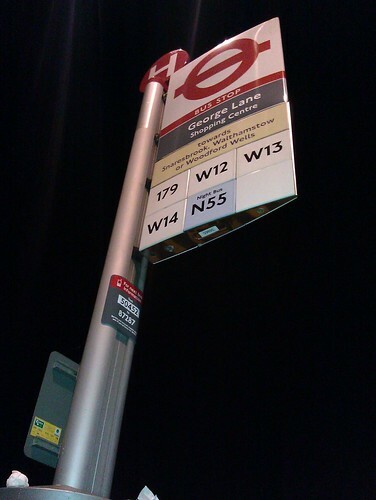 A very nerdy observation obviously…but I’ve seen my first bus stop with the code on it ready for the Real Time information. In my opinion, it’s going to be such a game changer for bus transport – no more turning up and hoping…check before you leave the house! 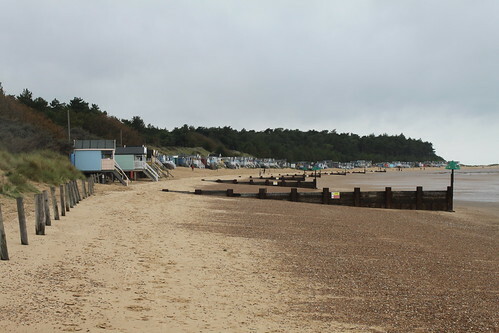 Norfolk Holiday – Day 4 – Is Wells-next-to-the-sea? We awoke to rain so very quickly abandoned any plans for cycling. Yes, it’s true we are still fair-weather cyclists! So, instead we opted for the coast-hopper bus for the 20 mile journey to Wells-next-to-the-sea. A lovely ride through some very picturesque villages, including some so narrow it felt as if our bus had to breathe in to squeeze though. 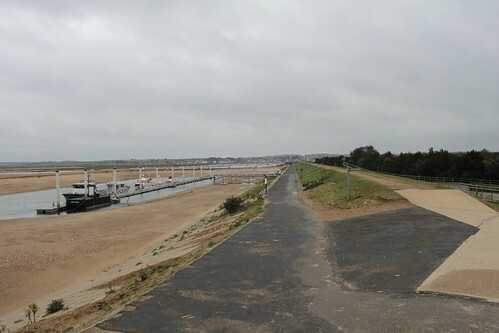 We arrived into Wells at low tide, so it was very much Wells-about-a-mile-and-a-half-from-the-sea – see above! Down by the harbour (in shot above, but so far away you won’t make it out!) 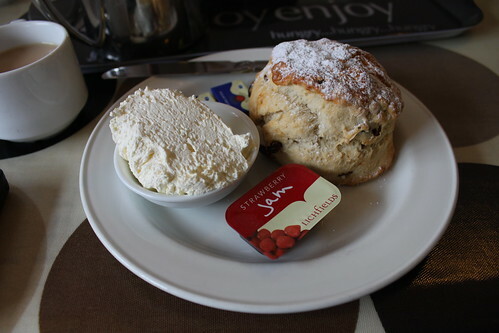 we managed to find a café for a cream tea, a favourite holiday treat. The actual sea was at least another mile away on the other side of a deep shipping canal carved into the sand! It did at least look like at high tide this area became sea. Back into Wells again we trawled the charity shops looking for Tugs. No luck! We then took the bus back to Sheringham for fear of being stranded in Wells – being in the countryside proper here, all public transport stops at 6pm (the public don’t want to go anywhere after 6pm apparently). 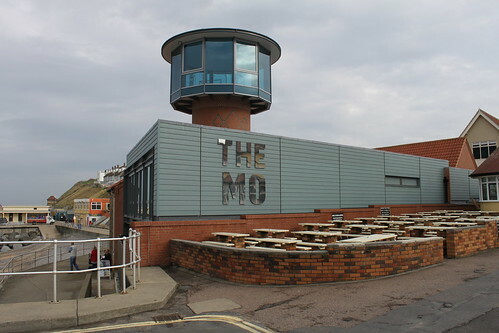 This gave us chance to wander around ‘The Mo’, Sheringham’s new lifeboat and fishing boat museum. A stunning building with some interesting facts and figures (especially if you like boats). Friday night’s tea was provided by The Crown, a fairly large bog standard pub close to the sea front. A full range of Greene King beers and for the price fairly average food. (Note, before you accuse me of beer snobbery: I’d much rather live in a world dominated by a large brewery like GK than live in one devoid of ale, OK?). We popped back to the Windham Arms for the 3rd and final time, this time managing to sample Woodforde’s Nog – something I tried to brew as a student. Needless to say, Woodforde’s version was much better. A proper ‘old ale’, dark but with a real sourness that is more like the Belgian lambics than a modern English bitter. Fantastic stuff. And with the pint finished, it was time to wander home and pack for our final adventure. Norwich and home.